‘[The Kerry Pippin] is one of the best varieties of its season, ripening just after the Devonshire Quarenden; like which variety it is, however, of short duration. […] The fruit is seldom larger than represented in the plate; its form usually almost globular, having some plaits or wrinkles about the eye, and a few broad projecting folds surrounding the stalk; a slightly furrowed mark, as shown on the largest fruit in the figure, is frequently observed. The skin is of a fine straw colour, shaded with deeper yellow, striped and speckled with fine red, highly polished. The flesh is yellow, tender, sweet, and well flavoured. […] This variety has been long cultivated in Ireland, though little known in this country: its conspicuous appearance and good qualities, however, justly entitle it to a place in every collection.’ [PL pl.20/1818]. ‘An early dessert apple of the highest excellence; It is in use during September and October. The tree is a free grower, hardy, and a good bearer, attaining about the middle size. It is well adapted for grafting on the paradise stock, and being grown either as a dwarf, or espalier. This variety was introduced chiefly through the instrumentality of Mr. Robertson, the nurseryman of Kilkenny, in Ireland.’ [BP p.122/1851]. ‘A very good middle sized fruit.’ [David Crichton NHM vol.1 p60/1864]. 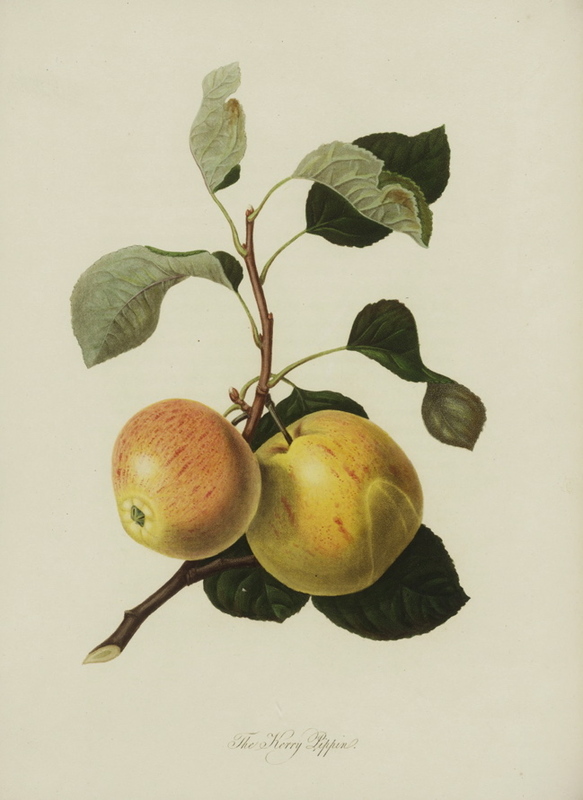 Listed as ‘Kerry Pippin, apple no.72’ in a hand written list of apples in an 1850 catalogue held at Camden Park [CPA]. Most of the plants hand-written in this catalogue subsequently appeared in the 1857 catalogue. That the apples did not is probably an oversight.